Robert Raymond Money was granted his commission as a Second Lieutenant in the 3rd Battalion, East Yorkshire Regiment on 10 March 1915. Transferring to the Royal Flying Corps that same year, he opted to be trained as an observer, and on completion of his training, was posted to 12 Squadron, then stationed at Netheravon. Departing with the squadron for France in September 1915, he served until April 1916, at which time he was posted to Home Establishment to train as a pilot. After three months in the UK he was posted back to France in July 1916, and assigned once again to 12 Squadron, this time as a pilot. On 17 September that year he was shot down during a disastrous bomb raid to Marcoing railway junction, but survived to be captured. He remained a prisoner of war for the remainder of the conflict, being incarcerated at a number of different camps during this time. Following his repatriation to the UK, he remained briefly in the Royal Air Force, before opting to return to his regiment. With the latter he was stationed in Ireland, where he saw service during the first serious stirrings of the IRA's war against the British forces. Returning to the RAF on a short service commission in 1923, he served for a further period, mostly with the Fleet Air Arm, where he performed duties as a flying instructor in Scotland. 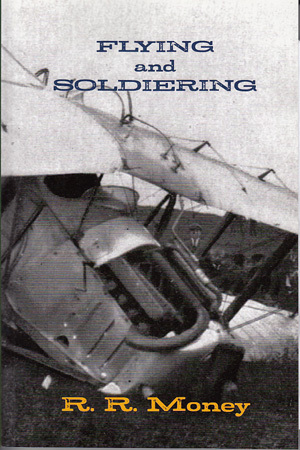 He relinquished hi s commission in June 1932, and published his autobiography, Flying and Soldiering, in 1936.